But they’re not, and much like that kid who says he’s a movie buff and has yet to see “Citizen Kane”, there comes a time in life where you realize that not everyone will appreciate things in the same way you do, which puts “Rayman Legends” in a strange place. Can a high-quality, premium priced, unabashedly charming 2D platformer contend with the violence and spectacle and ‘maturity’ of “Grand Theft Auto”, “Call of Duty”, and “Assassin’s Creed” - devoid the rose tinted glasses of nostalgia? Sales wise? Probably not. Quality wise? You bet your power glove. “Legends” impresses on the A/V front immediately, presenting a ribald atmosphere and a seditious, just-left-of-center art style that would feel right at home with classic animated shows like “Invader Zim” or “Fairly Odd Parents”. The audio is great too. The menu screens feature minimalist Banjo and Ukulele strummings that seem eager to break out into that cover of ‘Over the Rainbow’ that made an entire generation of nerds teary-eyed at the end of “You’ve Got Mail”. The in-game music is robust and bombastic too, featuring tunes that sound eerily familiar to “Lawrence of Arabia”, and a fantastic mariachi cover of “Eye of the Tiger” that you’re required to jump in time with. Toe tapping optional. But you’ll do more than jump. 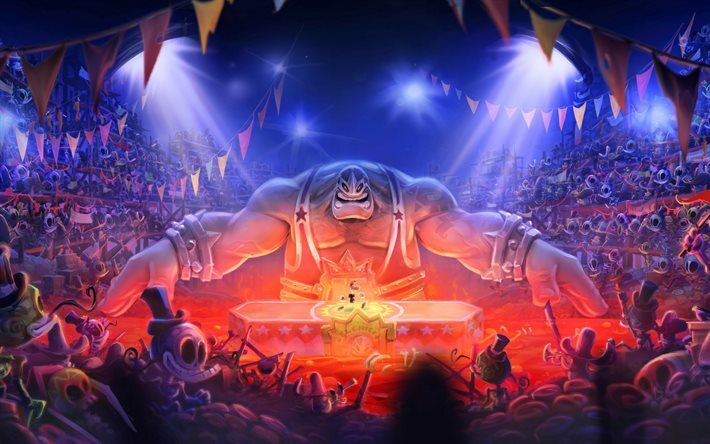 “Rayman Legends” has you punching, kicking, sliding, hanging, floating, and swimming across well over a hundred levels of varying difficulty and purpose. Stages are broken up into paintings, then several more paintings within those paintings, all of which contain a number of teensies (think a Smurf with a bad head cold), that need to be collected to in order to advance and unlock more levels - essentially merging Mario 64’s collect-the-stars-in-any-order system into a 2D world. It rocks. It rocks because “Rayman” nails the ‘for all ages’ thing without being condescending, allowing players to create their own difficulty. Inexperienced or disinterested players will likely be content to make their way through a level, but (hopefully many) others will instead slave over a given stage until they collect every Teensie and obtain every trophy - which often requires engaging in tricky challenge rooms and exploring every nook and cranny of a given level - in one of those rare instances where a video game doesn’t think for you via mini-map or objective indicator. Regardless of how you choose to play it, the difficulty curve is just right, like one of those treadmills that increase the incline so infinitesimally you don’t notice until your calves are about ready to file for emancipation. There’s a decent amount of variety here, too - while every level features the jumping, punching, and saving of teensies, some are done via ‘chases’, where the left side of the screen is either fire, lava, or a giant angry mexican wrestler, and you need to clear the level without stopping. Others are ‘invaded’ levels, which are super hard remixes that challenge you to beat it in a specific time, else lose out saving the teensies on that stage. The best of these, however, are the simply magnificent music levels, that have you jumping and sliding and punching to the beat of a song. “Rayman Legends” transcends itself during these levels, becoming something as close to magic as a 27 year old college educated fellah could ever hope to believe in. Every beat, every movement, every player input, when done right, corresponds so splendidly with a given song - be it a salsa, rock ballad, or orchestral arrangement, that you simply do not want them to end - it’s all the joy of “Rock Band” with none of the existential stupidity of needing plastic instruments. You’ll laugh out loud from pure joy. You’ll also chuckle quite a bit at a lot of the other stuff in the game. “Rayman” is funny in a subversive way, from silly level names to deliberate references to “Terminator 2”, to how in those blessed music levels, enemies will pop in and sing parts of the chorus. And once a bunch of space devils play a tango on the butts of your fallen enemies by way of pitchfork, you may just roll your eyes at the audacity while your heart slowly warms. 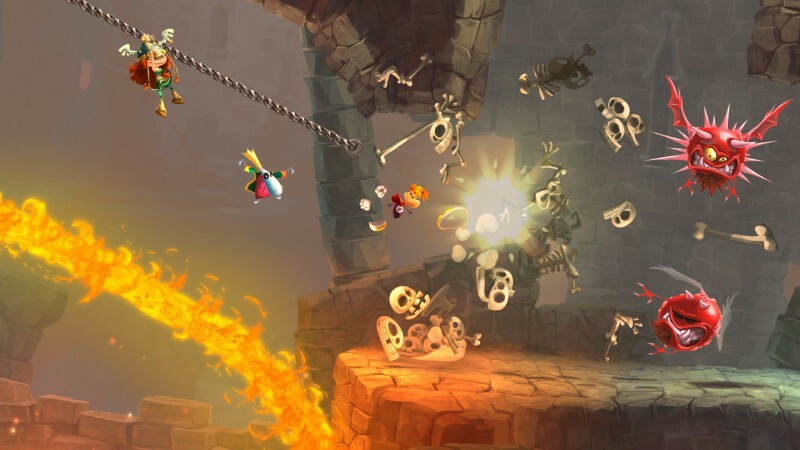 Audacious is a good word to describe the overall “Rayman Legends” experience. Releasing a game like this, at a time like this, takes the same kind of cojones that releasing the silent film “The Artist” did a few years ago. Here’s a game that challenges, entertains, delights, and delivers everything you could possibly want from a title, completely confident in its 2D platforming nature, not worried for an instant players won’t get it, or think it’s ‘for kids’. Toss in co-op and there really isn’t a single bad thing I can say about it except my thumbs hurt, my eyes are dry, and it made me late for work, which are all wonderful problems to have. “Rayman: Legends” was developed by Ubisoft Montpellier and released by Ubisoft. The version reviewed by Paul Meekin (@MeekinOnMovies)was for the Xbox 360 but the game is also available for the PS3, PC, Vita, and WiiU (with exclusive features).